Following on from the last post, I saw this and thought how the gospel was explained in this video was great. life in 6 words (dare2share ministries) excellent webpage. This is the week that we celebrate and think on how all this is possible. Without this week - if it never happened, there is no gospel, but thankfully Jesus said yes, even knowing beforehand - before becoming flesh taking on the form of man that this would all happen. The cheers from the crowd on palm Sunday that would quickly turn to jeers on the day He died. The palms the crowd waved, changed to his palms nailed to the cross on Friday. The weeping on Friday turned to leaping on Sunday when he rose from the grave - He's alive. Here is last year's posts what Palm Sunday is all about, to what happened that week. part 2 what manner of love is this? On Saturday we went for a drive and we passed this field of daffodils. 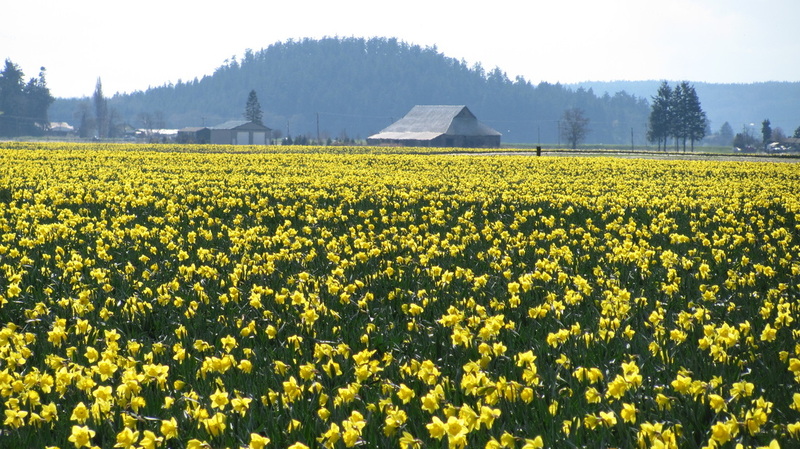 As far as the eye could see, all you could see was a yellow sea of these trumpet shaped daffodils. 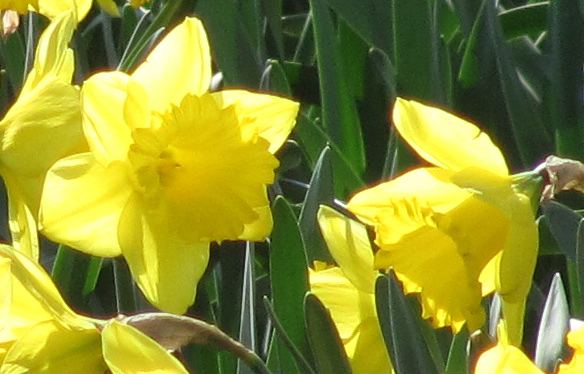 They aren't with us for long but they herald in, loudly proclaiming, through their trumpet shaped head, that Spring is here. used for us to stop and take notice as something important is about to be announced. "All you inhabitants of the world and you who live on the earth, when a banner is raised on the mountains, look! When a trumpet sounds, listen! " Is it to be reminded that we don't know the day or hour of His coming so let's not waste an opportunity in telling others about Him? Or don't put off coming to know Jesus - the time is now. You may not get another opportunity - there will be a time when you stand before God and it will be too late, if your name isn't written in the book of life, but it's never too late right now. Or maybe you are trying to communicate to people around you what the true good news is. Do the people in your life know that, or are they confused and don't understand what it all means? Do you even know if they are confused, or are they too polite to tell you they don't understand what you mean? I know I'm dreadful at this - I don't have a mobile phone, I'm not up to date with the latest lingo regarding social networking but I am trying. Why? Because it is important as Christians to be able to communicate in a way that whoever comes into our lives they can begin to understand what we are saying. It's not about watering down the bible, it's about being able to communicate what it says effectively. You don't know who or how someone can come into your life even for a short period of time - even for one a'noon. So the attitude of "I'm too old, or I'm not interested, that's for the younger generation" isn't going to work. So let's not limit ourselves, God wants to do an amazing work through us - it's us and our attitude sometimes that gets in the way. "A famous acrostic was made for the acclamation JESUS CHRIST, GOD'S SON, SAVIOUR (Greek: Ιησούς Χριστός, Θεού Υιός, Σωτήρ; Iesous CHristos, THeou Yios, Soter). The initials spell ICHTHYS (ΙΧΘΥΣ), Greek for fish – hence the frequent use of the fish as a symbol for Jesus Christ from the early days of Christianity to the present time." The above quote is taken from the acrostic website. You can put in your name and you might find your name in a verse. If you can't or even if you do find your name, why don't you try and find a set of verses you do on your own. Try your favourite verses, verses that hold a special truth for you. It's a great way to memorise them and by inserting your name throughout, it brings home the message to you in a personal way. I did it here to show you, and think it's a great idea for wallpaper for your computer. Pick a favourite photo and use any program - photoshop, powerpoint, paint and put the verse on it. If that isn't your thing, what about cross-stitch, calligraphy or try and think how you could incorporate it into your hobby. I think it could be a fun project to do with your child no matter the age - they could paint a background picture and you put the writing on it, while sharing with them the truth in a personal way. You can even pick your friend's name and make a bookmark or whatever your hobby is, it is a fun thoughtful gift as well as a good way to reach out to non christian friends - just think more carefully what verse you would use if you do that. Have fun and don't stop at one set of verses, or do different backgrounds. So what verses did you pick that mean something to you? Last year I brined the turkey this year I decided to go with the butter under the skin approach. 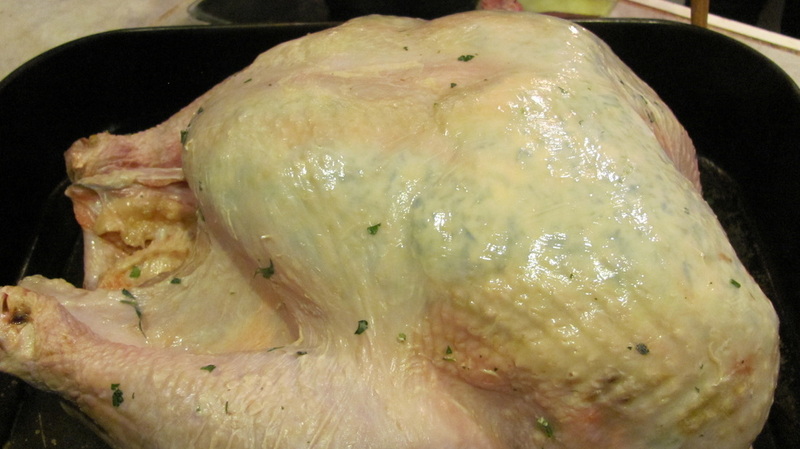 All the butter oozes into the breast while it is cooking, keeping it moist, while the herbs give it some flavour. I don't know if you can see that clearly or not with the photo, but you can really see the herb butter through the skin and where there is more butter and not as much - there is a big bulge making it more obvious where there is a ton of butter. Isn't that a bit like God working in us? In Hebrews 13:21, it talks about God at work in us, as well as Philippians 2:13. Looking at that butter under the skin, I was reminded of this. When people see us, if we are a Christian, they should see God shining through. Our bodies are the skin but when we are walking with God it's the Holy Spirit that is shining through. The herbs being the flavour - the fruit of the Spirit - clearly evident in our life. When I said to Anthony I was going to get the camera to take a picture of the turkey, he just looked at me and thought I was mad. "Why would you want to take a picture of that, it's so unappetising looking?" He didn't realise the parallel I was thinking about for this blog entry. It's because it was unappetising looking I also wanted to post the picture. As so often when we are going through a hard time we don't want anyone to see us, and want to work it all out with God then share "hey folks, God taught me this through that hard situation." When in fact God wants us when we are at out most vulnerable, our 'unappetising' looking to share with Christians and non Christians alike. Why? 2 Corinthians 12:10 explains it. When we are weak, that's when God shines through us the most. People can see God at work in our lives the most when we go through the hardest times, when our 'skin' is the most see through, so don't hide it. Let others see your vulnerabilities, where you are the weakest. Is it patience, or understanding? Whatever it is, like the big bulge of butter, God might have been working in one area shining through, but now it's time to get into the part of your life that needs His help. Like the butter he will permeate through that thing you find difficult and others will see the difference as well. So whatever it is, if it's going through hardships, a hidden or hard part of your life, let the herb butter of God melt in you - oozing down every part of your life. Not just one area; be vulnerable and let others in so they can witness the power of God as they see Him working in your life. Don't be a skin deep Christian. Let God work in all areas of your life, yes like the turkey it can get messy but after it's done - the difference is amazing. Just remember that your life like the turkey still needs basting, let God continue to baste you. Doesn’t everything taste better if it’s homemade? Or should I say if it’s done well, as there are things I’m not good at - Christmas cake being one of them. My sister makes a great Christmas cake and shame I’m not back in the old country this year to taste it. 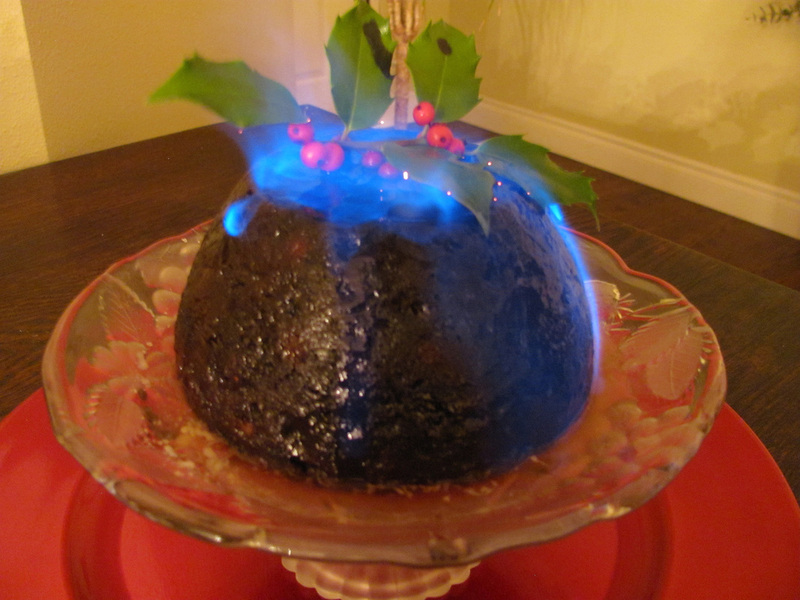 I love Christmas puddings so I make my own which are much better than bought. Not because of my cooking but I don’t think you can go wrong in making them thankfully! I didn’t know all the history of the pudding and thought it was interesting that in the “food and cooking in Victorian England” it gives some background. It says that in medieval England the Roman Catholic church made a decree that the "pudding should be made on the 25th Sunday after Trinity, that it be prepared with 13 ingredients to represent Christ and the 12 apostles, and that every family member stir it in turn from east to west to honour the Magi and their supposed journey in that direction"
Thankfully I didn’t live back then with religious rules (although today there are loads of them as well) or even in the 1600s as the puritans banned it for having too rich ingredients! My pudding has more ingredients in it than the decree of the RC church and I make it when I have the time. But I love stories and associations like that as it helps us in that moment of doing something to turn our thoughts to God. 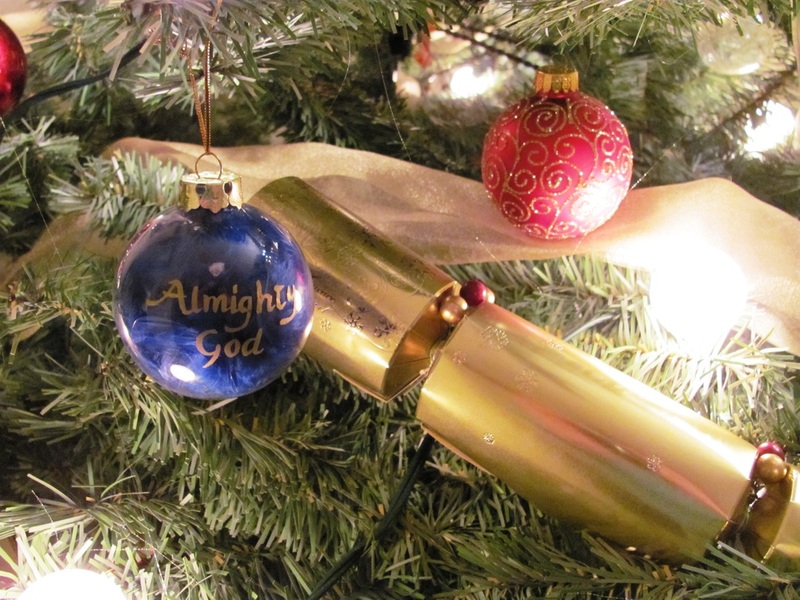 As well as having something simple like that to give us another opportunity to share with others about God and here the Christmas story and the good news of Jesus who He was and why he came. I knew about the tradition of every family member having to stir the pudding when it’s being made but thought it was more superstition with making a wish. So let us make known the reason behind it and may we instead of making a wish, we could say a prayer to God. Not forgetting to say thank you to Him for humbling himself not only in taking on human form and being born in a manager but willing to lay aside his majesty, his right, for a time. It’s also superstition that when making the pudding, different items were put in the pudding. Thimble was for spinsterhood, ring for marriage, a coin for wealth. How awful that was, as if you were a child or easily led, you could end up believing that! I don’t know what we could put in instead that could further telling of God or the Christmas story to others, but wouldn’t that be a good idea? ie for one item, maybe a coin (well wrapped in foil) to represent the gold the wise men brought. I think the long steaming time of a pudding can represent the tough situations we go through on earth. It feels long and sometimes it’s hard to see it in light of eternity and why we have to go through it. Just as we have to constantly top up the water when we steam a pudding and make sure it doesn’t go dry, when we go through the hard times in life we have to be constantly filled with the Holy Spirit. He is then with us through it all, permeating through us just like the steam in cooking. 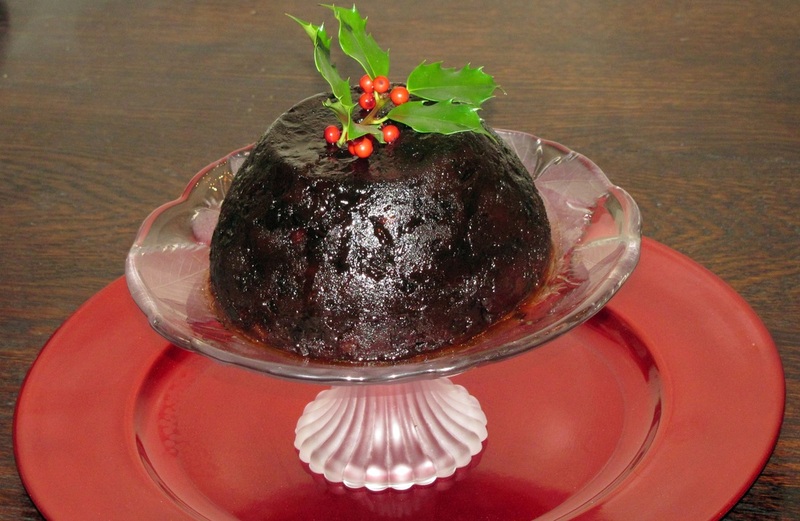 When ready to serve, you turn the warm pudding onto a plate and put holly on it, the berries representing Jesus blood on the cross and the crown of thorns. It is put on the top of the pudding – Jesus being the head of the church and us as individuals. It’s by his blood and trusting in Him we are healed. All the different ingredients, all our different gifts come together and form one church and the ingredients complement each other no one being better than the other but all harmoniously working together under God. When we allow God to fill us and we follow His will and do the ministry/work He wants us to do, this is what happens. Finally when you taste the pudding, the time it takes to make it and go through all the steaming - it’s worth it. Just like when we reach heaven for eternity we will realise that it was all worth it. The steaming and the maturing of the pudding caused the true flavour to be produced just like in us. Romans 5:3-5. My old garmin GPS died on me and on a day I really needed it and I didn't know where I was going, which is a frequent thing with me. So I am all excited with my new must have toy. This really is a must have for me as I can't even find my way to places I go frequently. Driving home today I was struck by so many similarities from our walk with God and Daniel. Daniel is what I call my GPS, I had to hunt to find and download his voice "British-English Daniel" but now all is well that he is guiding me again on the roads. I love Daniel (it may be Jill to you) as he is so patient, never gets cross or irritated no matter how many wrong turns I take. He is always there guiding me back from my own weird detours because I made a mistake and didn't follow his instructions, which have sometimes resulted in some weird, dark places. Thankfully he doesn't hold a grudge and immediately is trying to get my attention, gently pointing me back to where he was trying to get me to go all along just like God. However patient and calm and assuring I think Daniel is, how much more is God. In fact God is so patient with us it's hard for us to comprehend. The new feature that is on this GPS that my old GPS didn't have is your current speed in black or red. Red if you are speeding and beside it the speed limit of the road you are on. My speeding (even by 2 mph) was literally in my face, not hidden in my dashboard that I never look at. It was instant and constantly going red to black to red. There are roads I am daily on and didn't know the speed limit as there are no signs up but thanks to Daniel I now do. I was reminded of days that I might have a quiet time but it's more of a off-load not a listening to God thing and the rest of the day my mind is elsewhere, or the days I haven't one. That to me is like the speedometer in the dashboard, God isn't first in your mind. You can go through the day without actively talking to or listening to God as you have to take your eyes of the road/problem for a second and actively remember to look at the speedometer/for what God is trying to tell you about a situation - moving too fast, too slow. Sadly far too often we can forget to look for God until it's too late just like we can forget to look at our speedometer and get a speeding ticket (sin). 1 Thessalonians 5:17 - constantly in prayer. Whatever the situation your mind is on God, He is always in your field of sight. Instantly speaking to you, letting you know if you are in the black or are close to going into the red. Another feature that is new to me and I'm loving is the 3D junction view - what the junction with the signs actually will look like (in major areas). As sometimes I look at the grid map and can still get a bit lost and by the time the signs come I get flustered as I'm concentrating on driving while trying to figure out what lane I need to be in and reading road signs. God gives us the bible, like an overview - the grid map but He doesn't just leave us to figure it out on our own or how to apply it. When we are walking with God, He speaks to us in our situation, that situation that might not have a direct verse for it but he gives us direction, peace of mind about how to handle it. The junction view won't contradict what the grid map says, it just gives clearer instructions about an entrance or exit along with the upcoming lane assist. Another new thing (one after another just like God's blessing's to us!) is free lifetime maps and traffic alerts. Sometimes we feel God is calling us in a certain direction or to do something and 'traffic' or obstacles get in the way. These are our teachable moments, our faith moments, trusting in God because it's out of our hands moments. God showing us, helping us by doing this - that whatever comes up I have it, trust me. Reminding us that it's never our plan but God's so we don't get tempted to think that it's our way or go off on our own route. Unlike the traffic avoidance system in the GPS, God wants to take you through the obstacle not avoid it to show you He is in control of it, the obstacle isn't in control. Free liftetime maps. Free to us, God's life maps. God is always updating them for us, always there and unlike a GPS won't break down, won't lose a signal/prayer. You can ask a GPS certain questions, where is nearest shops, petrol etc and it will tell you. God will answer you when you have life's important questions, will you help me? Can I have eternal life with God? Where are you in life? Do you know God as your personal savior and Lord are you walking with Him? Just like a GPS that is there but will only help you if you come to it and turn it on, God is there but you have to ask Him into your life. If you're lost don't be too proud to come and ask God for directions. Reposted from 'thought of the day' 12/26/2011 All links in this website are underlined and usually in dark blue. This does practically help. For then we know who our God is. What His attributes are. This doesn’t only just help in our worship to God but it helps us when we hear people make statements about God. There are so many false or not 100% true things said about God. Then we can take those statements and compare it to what we have learned and know about God. And even share with those people why it’s not true and how we know it. Everyone seems to agree that the exact derivation is uncertain or unknown. 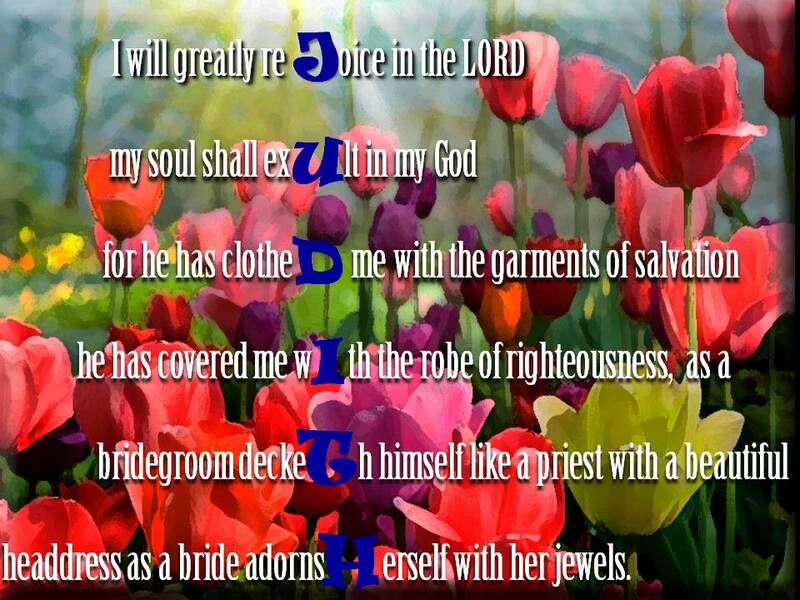 “The Hebrew word "shad" or "shadayim" (meaning "breast" or "breasts") occurs 24 times as "Shaddai" and signifies One who nourishes, supplies, and satisfies (Isaiah 60:16, 66:10-13). Combined with the word for God, "El", it then becomes the "One mighty to nourish, satisfy, and supply". This illustration of El Shaddai keeping us to His breast reminds me of day 2 and how we looked at the verse Isaiah 40:11 “He tends his flock like a shepherd: He gathers the lambs in his arms and carries them close to his heart.” This takes it one step further. A mother feeds, nourishes her baby while keeping him or her close to her heart. The baby is 100% reliant on the mother for all their needs. God is giving us that picture to us. That El Shaddai will meet all our needs, He will completely satisfy us. Because El Shaddai is mighty, and He has the power and strength to do so, He will let nothing stand in the way of it. For Hamish, Anthony and I are the ones who satisfy his needs. We love, exercise him, feed him, try and keep him from getting bored, we have rules and discipline him. He needs discipline like a child, to know the boundaries, what is and isn’t acceptable behaviour. If you think of a mother and her baby if anyone threatens her child, she will do anything to protect the baby, even dying for him or her if it means they have a chance to live. 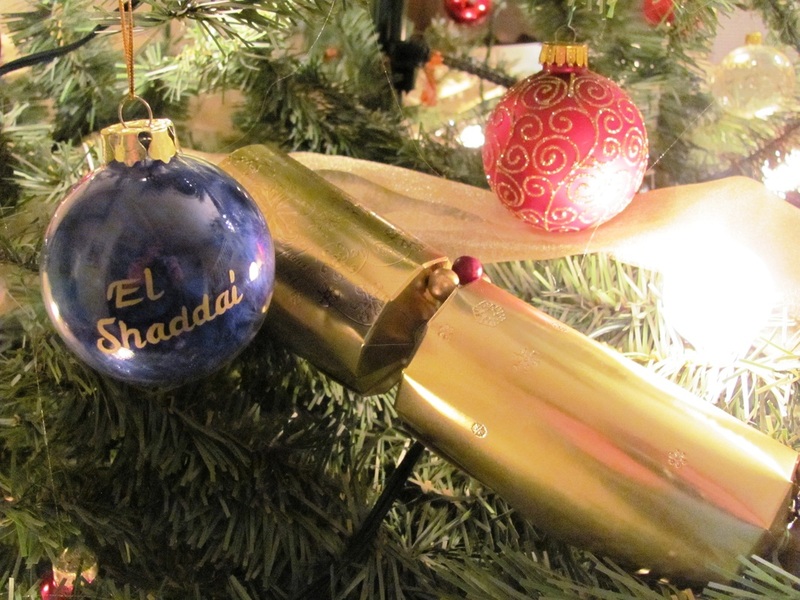 Maybe that is why the Hebrew ‘shad’ and ‘shadad’ are so similar? I honestly don't know, but the picture of El Shaddai being so powerful to overcome anything or anyone compliments the picture of El Shaddai being our all sustaining – All Sufficient One; the one who supplies all our needs. Do you let him satisfy and supply your needs? So many people try and satisfy their God-shaped hole with work, addictions, even work for God. If you don’t draw near to God often, like a baby to their mother’s breast to get nourished, taking time to feed, then nothing or no one will fill that hole/hunger. This is a lovely song to reflect on a couple of names of God. All links in this website are underlined and usually in dark blue. I found myredeemerlives and blueletter bible to be the most helpful for this name. All of the meaning of name, link to verses (Isaiah 26:4) were from my redeemerlives. The singular most helpful website for me in this complete study. There were so many more gems there and in other links I gave that I deliberately didn't put in these studies, so you have the joy of finding them for yourself! There are numerous studies and websites online and in books that I haven't mentioned. When I have forgiven someone and I think it is forgotten (it can be years ago); sometimes it comes back to me in my mind and on occasion has even annoyed me all over again. I have to go back to God, apologising for my own thoughts as well as forgiving and leaving it again with God. I can be tired and something that normally wouldn’t bother me suddenly annoys me. Hamish can be ‘trying’ some days when nothing seems to have changed. He will leave an ornament or something alone for ages then suddenly decide to go after it. I can have patience with him one day and the next have none. He will never change His mind about saving me, never stop loving me. You don’t need to live in fear that one day He will surprise you with your past forgiven sin and hold it against you. When events just seem to be ever-changing around you, like photos cycling through a screensaver; one minute everything is fine the next everything is crumbling around you. Remember God is unchanging; He will always be El Olam. So you can trust El Olam, put your worries, burdens onto Him. 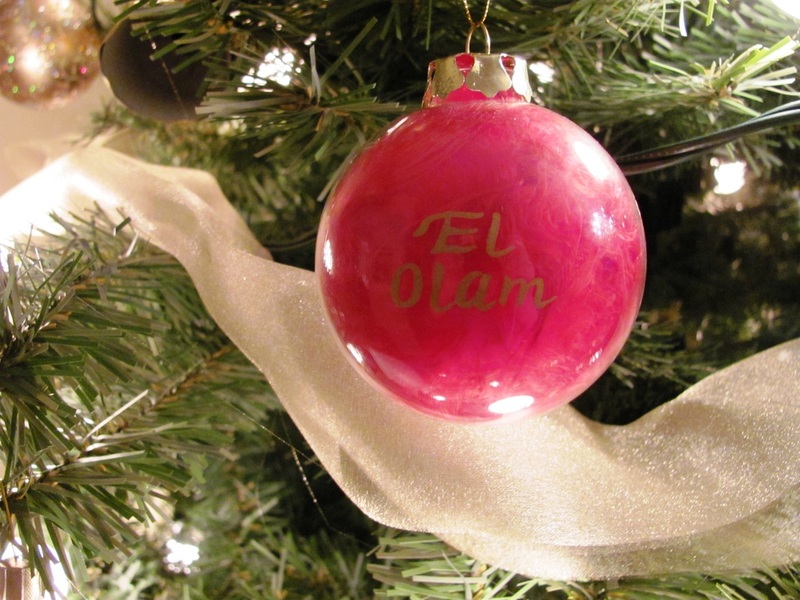 El Olam is the rock eternal – nothing can crack, puncture, shake, drill, explode, prod, or damage the Rock eternal. If you are saved, nothing can pry you out of His hand (John 10:28). Our salvation is assured! Do you believe that or doubt it sometimes? Or do you need to come and know you are saved from your sins so you can spend eternity with God? I was trying to think of all the songs that had reference to God the rock. Looking at lyrics relating to the different names of God is another way to remember, worship and apply what we have learned. Ascribe greatness was the first song I thought of. His work is perfect and all His ways are just. For some reason it was the old hymns I remember not the new songs. Even if these hymns aren’t to your musical taste the words are lovely. Rock of ages is a very old hymn, this website gives the history of hymns as well as music. Hiding in thee Another website with music, history and lyrics although you would have to open up two pages as you can’t view the lyrics and the music together. Cyberhymnal (above links) also gives this song. How many can you think of? These are just a start. 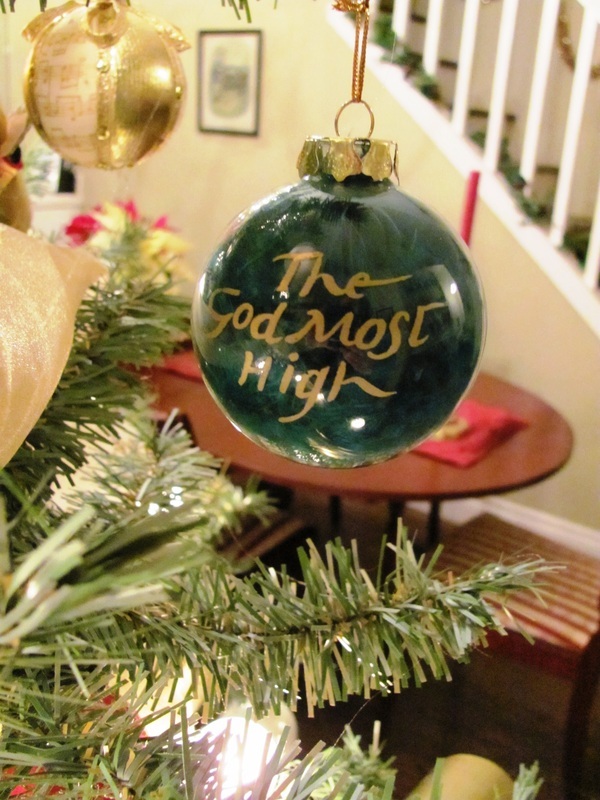 Try and do it with all the names of God! Reposted from 'thought of the day' 12/23/2011 All links in this website are underlined and usually in dark blue. Just two more days in the ‘and now for something completely different’ style post. I have been giving you links to the places I found when doing this study. I have only given you a couple of links a day as I don’t want to overwhelm you, but you can find for yourself which ones are personally helpful to you. preceptaustin.org this is more general. 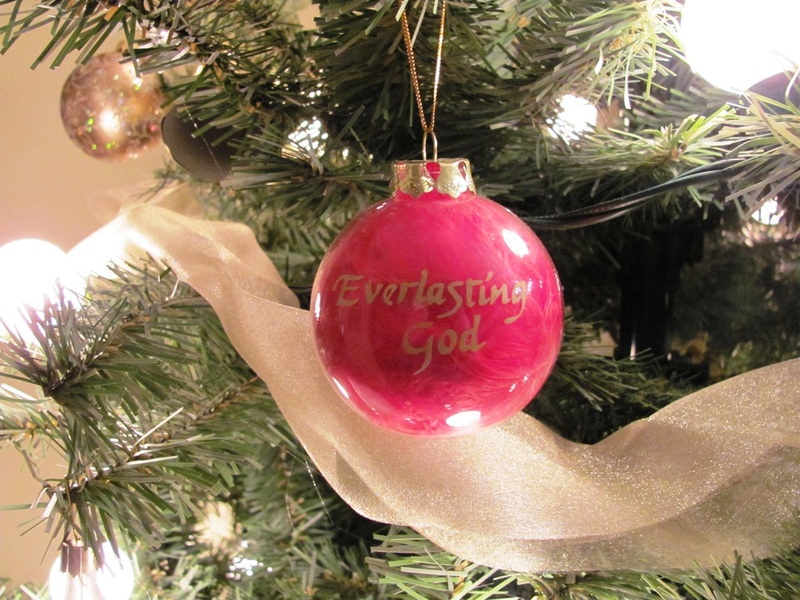 smilegodlovesyou.org gives a list of names of God, their meaning and 1 or 2 bible verses. Have you ever wanted to have eyes in the back of your head? It wasn’t until I got Hamish that I found myself wanting that. There are many times I would love to be able to see where Hamish is and what he is up to, at all times. Sometimes I find him doing funny or cute things that I have just missed out on. Other times it’s because he is about to eat a battery or other things he shouldn’t be doing. I would love to have eyes in the back of my head so I could warn Him of the danger or encourage him when he is doing something good. I don’t have that with my dog but thankfully we have all that with our God. Hagar used El Roi in her prayer when God saw her misery and spoke to her. Genesis 16:13 “She gave this name to the LORD who spoke to her: "You are the God who sees me," for she said, "I have now seen the One who sees me." Do you think God is too big to care about you, or wonder if He knows about your situation or need? El Roi sees everything and everyone all at once outside of time, knowing the fine details (basically what omniscient means.) 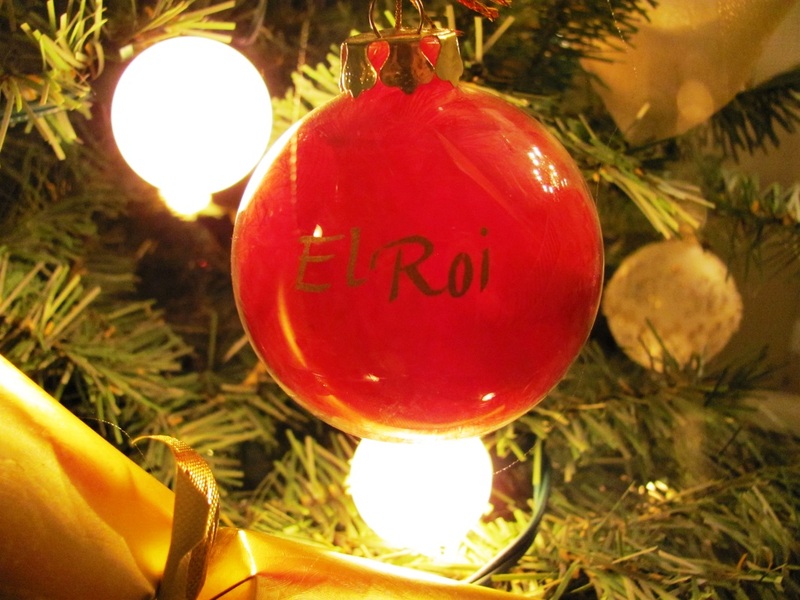 El Roi knows the motive of our hearts, our thoughts before they are formed. We can experience what Hagar felt. There will be a day, what an amazing day that will be, when we will physically see Jesus. In the meantime we can see God at work. Have you prayed about your situation? God wants to answer our prayers so we know that it was God that made it happen so our faith is strengthened. But we have to take it to God first! And if the answer is ‘wait’ or ‘no’ then God wants us to trust Him as He is El Roi. 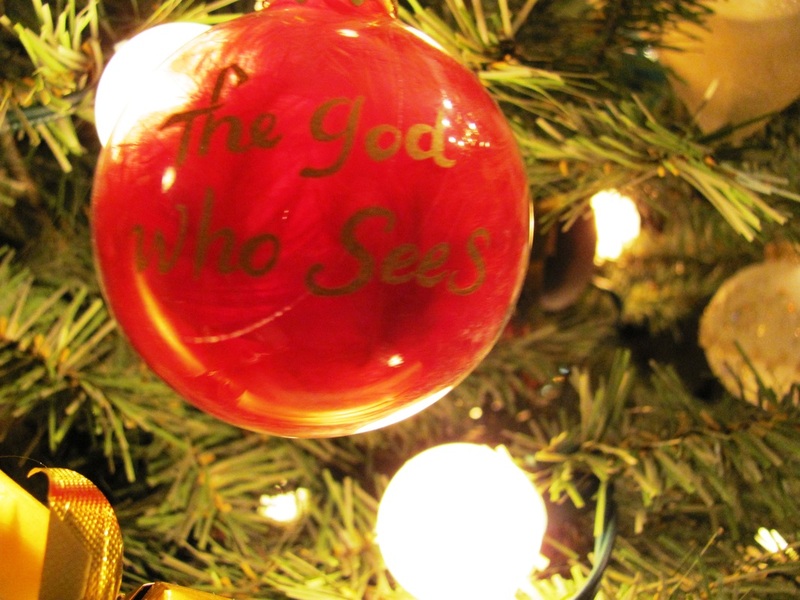 We can’t see everything only God can – El Roi sees the big picture. When God says no it’s because He has something better planned for you! Do you know El Roi sees all – the secret sin, the wrong motives: do you need to repent (turn away) from something(s)? - All the good that you do in secret. - The love in your heart when you do the sometimes unthanked jobs for the church or ministry for Him. - The love and unselfishness of being a stay at home mum, and or spending time teaching your children the bible and how they should be as people. - The unseen background jobs in service to Him. - Your faithfulness to God throughout, and in those difficult situations. El Roi - either comforting or terrifying! If terrifying, come to El Roi today and trust, confess and repent of your sins so you may find the comfort and peace from walking with God. Are you enjoying the study we are doing together? I know I am. 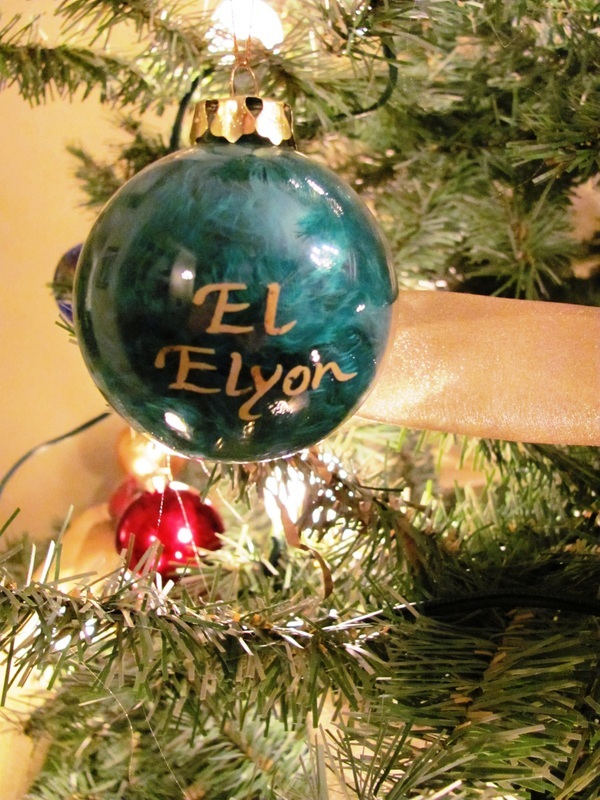 Today we continue our learning together looking at the name El Elyon. On day 1 we found out that “El” means strong, might, power. ‘El’ is translated God. "elyon" is an adjective and derives from the Hebrew root 'lh, meaning to "go up" or "ascend". The shortened form Elyon occurs more frequently throughout the Old Testament and when translated is “most High”. God is sovereign. All things have been God-filtered (as my Dad says) so you can trust God that if it has been allowed in your life, then God can work in it and bring some good out of it. Remember that this fallen world – disease, earthquakes etc is the result from Adam and Eve sinning. God didn’t want this! If it hurts you looking around and seeing the causes of sin – illnesses, disease, infidelity, murder, wars; then think of how God must feel. What we have done to His creation, the choices we make. Elohim made everything perfect, as He is perfect. God can’t abide sin, sin destroys, hurts, is selfish – everything that is the complete opposite of God. In Eden the choice for sin changed everything. In everything that is in our lives - illness, death, circumstances we can trust El Elyon, knowing He is in control. He works IN all circumstances the good and the bad. Although we live now in a world with the effects of sin, if we are following Him as Christians - God will take it and turn it around for good. If you are wandering “why doesn’t God stop all the wars, bad things and just end it and have a peaceful nice world?” El Elyon is going to! He will bring in a perfect world, with no sin or effects of sin. But because it is perfect only those who have had their sins washed clean by Jesus, made righteous in Him, will be able to live there. So God is patient because He wants as many people to repent and come to Him as possible. Do you need to come and know El Elyon as sovereign of your life? God is coming back; it can be anytime - right now, tonight! Are you ready, do you know Him? Bible studies, non dog related posts will be here. My non dog posts here but I'm continuing my dog posts over at 'thought for the day'!